By setting parts in epoxy, MSA can effectively freeze all components in place and then take a complete and undamaged cross section of a product using the cross-cut machine. 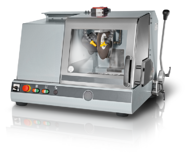 The grinding machine can then be used to finish the cut for handling. Upgraded microscopes with integrated camera systems allow MSA to review the manufacturing assembly process and the component interactions in the cross section, allowing us to reach even higher standards of manufacturing. Magnet-Schultz of America is committed to engineering and manufacturing the highest quality electromagnetic devices available, and this new addition solidifies our ability to deliver on that promise. Contact us today to see how we can contribute to the effectiveness of your equipment.